Tag Archive | "Venezuela: US Sanctions"
It’s an evident fact that neocolonial powers are ruled by behemoth corporations whose wealth is measured in hundreds of billions of dollars, far more than the total GDP of many developing nations. The status of these multinational corporations as dominant players in international politics gets official imprimatur when the Western governments endorse the congressional lobbying practice of so-called “special interest” groups, which is a euphemism for corporate interests. The developing economies, such as India and Pakistan, are always hungry for foreign direct investment (FDI) to sustain economic growth, and this investment mostly comes from the Western corporations. When the Business Roundtables or the Paris-based International Chamber of Commerce (ICC) form pressure groups and engage in “collective bargaining” activities, the nascent and fragile developing economies don’t have a choice but to toe their line. Such is the power of Washington-led global financial system, especially the banking sector, and the significance of petro-dollar, because the global oil transactions are pegged in the US dollars all over the world, and all the major oil bourses are also located in the Western financial districts. The crippling “third party” economic sanctions on Iran from 2006 to 2015 have brought to the fore the enormous power that the Western financial institutions and the petro-dollar as a global reserve currency wields over the global financial system. Despite the sanctions being unfair, Iran felt the heat so much that it remained engaged in negotiations throughout the nearly decade-long period of sanctions, and such was the crippling effect of those “third party” sanctions on Iran’s economy that had it not been for its massive oil and gas reserves, and some Russian, Chinese and Turkish help in illicitly buying Iranian oil, it could have defaulted due to the sanctions. On the other hand, the Persian Gulf’s petro-monarchies are actually three oil-rich states. Saudi Arabia with its 266 billion barrels of proven oil reserves and 10 mbpd of daily crude oil production, and UAE and Kuwait with 100 billion barrels of proven reserves each and 3 mbpd of daily crude oil production each. Together, the share of the Gulf Cooperation Countries (GCC) amounts to 466 billion barrels, almost one-third of the world’s 1477 billion barrels of total proven oil reserves. If anything, the Gulf’s petro-monarchies had “sanctioned” the Western powers in the past by imposing the oil embargo in 1973 after the Arab-Israel War. The 1973 Arab oil embargo against the West lasted only for a short span of six months during which the price of oil quadrupled, but Washington became so paranoid after the embargo that it put in place a ban on the export of crude oil outside the US borders, and began keeping sixty-day stock of reserve fuel for strategic and military needs. More than the size of oil reserves, it is about per barrel extraction cost, which determines the profits for the multinational oil companies. And in this regard, the Persian Gulf’s crude oil is the most profitable. Further, regarding the supposed US energy independence after the purported shale revolution, the US produced 11 million barrels per day (bpd) of crude oil in the first quarter of 2014, which is more than the output of Saudi Arabia and Russia, each of which produces around 10 million bpd. But the US still imported 7.5 million bpd during the same period, which is more than the oil imports of France and Britain put together. More than the total volume of oil production, the volume which an oil-producing country exports determines its place in the hierarchy of petroleum and the Gulf’s petro-monarchies constitute the top tier of that pyramid. What is the Impact of US Sanctions on Venezuela? What do people on the streets of London and Caracas think about US sanctions and Venezuela’s economic problems? A Simple Question takes a look. Venezuelan President Maduro says US-backed enemies of his country have launched an economic war on him. He also claims opposition leaders worked together in an effort to assassinate him and that they tried to overthrow him through violent street demonstrations. Despite pointing the finger of blame at US President Donald Trump, he still claimed he hoped to meet with Trump face to face. But in 2017 the White House responded to a similar request by saying such a meeting would only take place if the country returned to democracy. Diplomatic relations between Venezuela and the United States have been tense since the now dead socialist President Hugo Chavez came to power in 1999. Both Chavez and Maduro, his successor, have accused Washington of assassination attempts against them. Meanwhile, Trump has imposed financial sanctions on Venezuela and its state oil company. 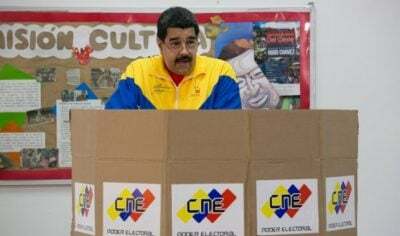 He has even imposed sanctions on President Maduro’s wife and several of his top allies to further increase pressure on the government. Venezuela also accuses the United States of encouraging its emigration crisis to embarrass Caracas, which has the world’s largest proven oil reserves but is in full economic collapse. Pro-government supporters of President Maduro have taken to the streets to protect against American interference after reports that US officials met secretly with Venezuelan military officers to discuss plans to oust Maduro. Posted in VenezuelaComments Off on What is the Impact of US Sanctions on Venezuela?